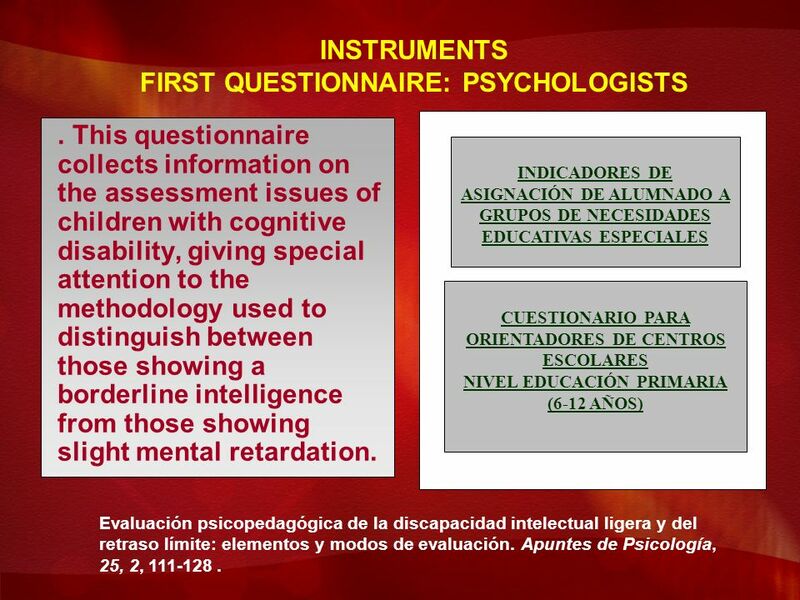 A PROPOSAL FOR ASSESSING COGNITIVE DISABILITY IN SCHOOL BY PSYCHOLOGISTS AND TEACHERS QUESTIONNAIRES Ángela María MUÑOZ SÁNCHEZ Remedios PORTILLO CÁRDENAS. 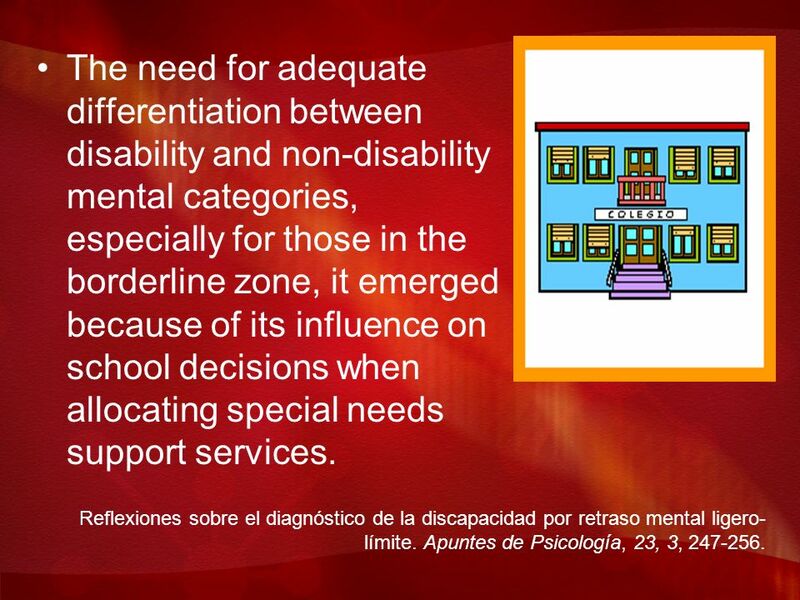 2 The need for adequate differentiation between disability and non-disability mental categories, especially for those in the borderline zone, it emerged because of its influence on school decisions when allocating special needs support services. Reflexiones sobre el diagnóstico de la discapacidad por retraso mental ligero- límite. Apuntes de Psicología, 23, 3, 247-256. 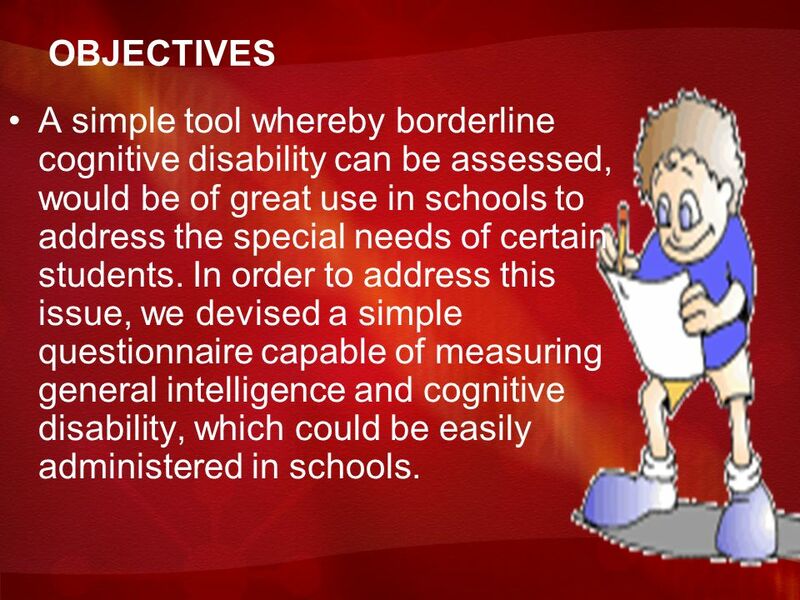 3 OBJECTIVES A simple tool whereby borderline cognitive disability can be assessed, would be of great use in schools to address the special needs of certain students. 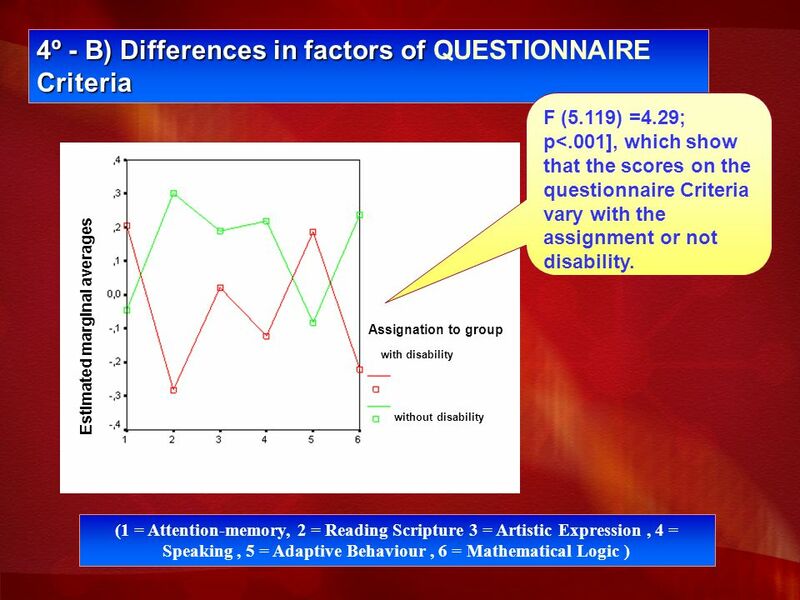 In order to address this issue, we devised a simple questionnaire capable of measuring general intelligence and cognitive disability, which could be easily administered in schools. 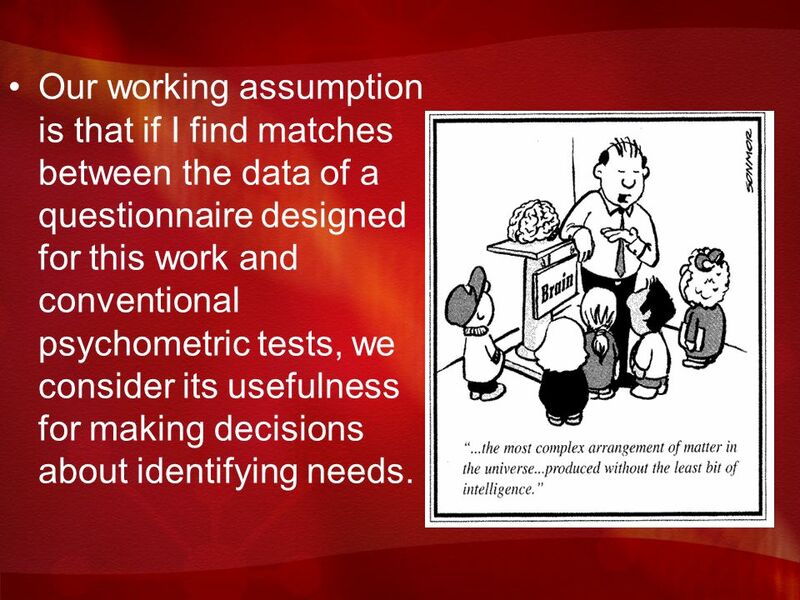 4 Our working assumption is that if I find matches between the data of a questionnaire designed for this work and conventional psychometric tests, we consider its usefulness for making decisions about identifying needs. 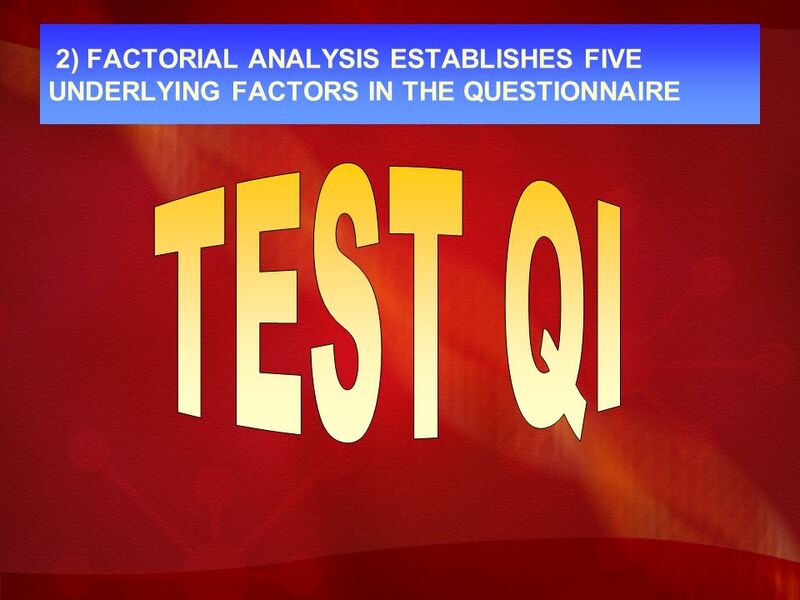 5 So we assessed the validity of our questionnaire, CRITERIA, by comparing its results with four usually administered standard intelligence tests. 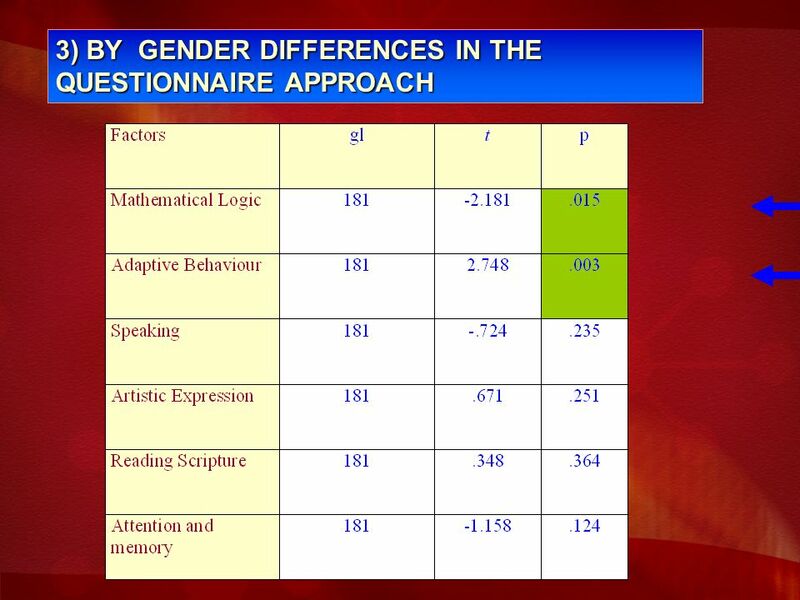 6 The Questionnaire was filled in by psychologists (female = 60, male =16, total N = 76). 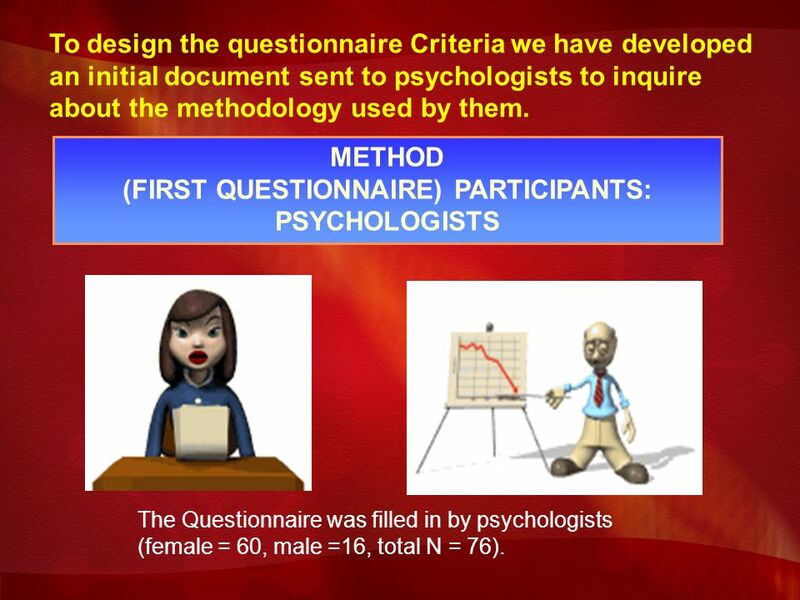 METHOD (FIRST QUESTIONNAIRE) PARTICIPANTS: PSYCHOLOGISTS To design the questionnaire Criteria we have developed an initial document sent to psychologists to inquire about the methodology used by them. 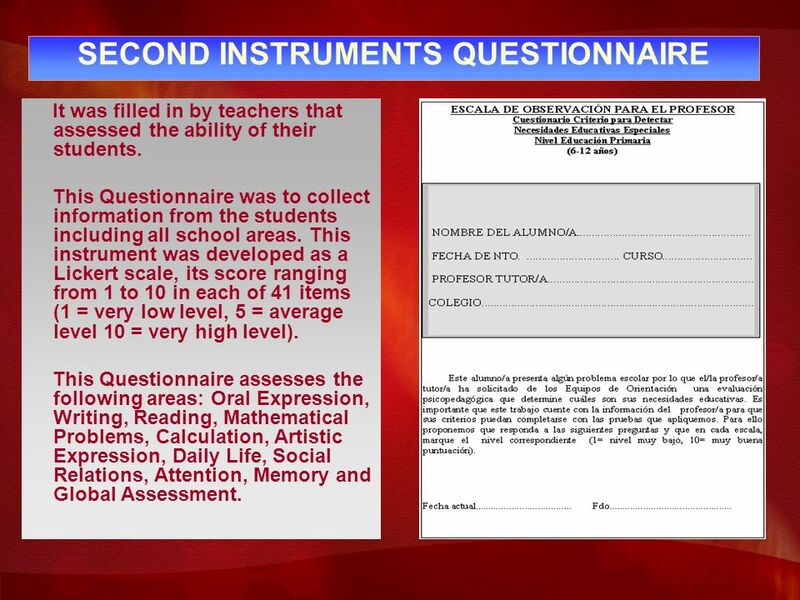 9 SECOND INSTRUMENTS QUESTIONNAIRE It was filled in by teachers that assessed the ability of their students. 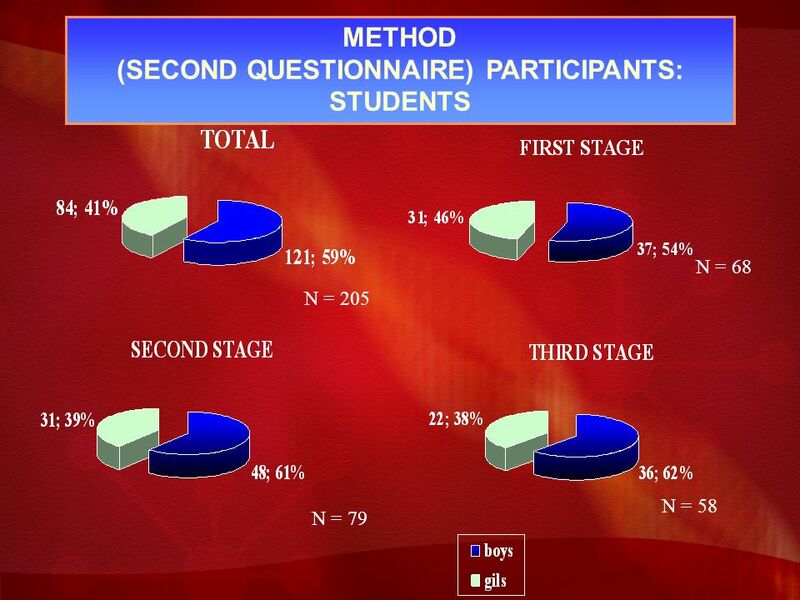 This Questionnaire was to collect information from the students including all school areas. This instrument was developed as a Lickert scale, its score ranging from 1 to 10 in each of 41 items (1 = very low level, 5 = average level 10 = very high level). 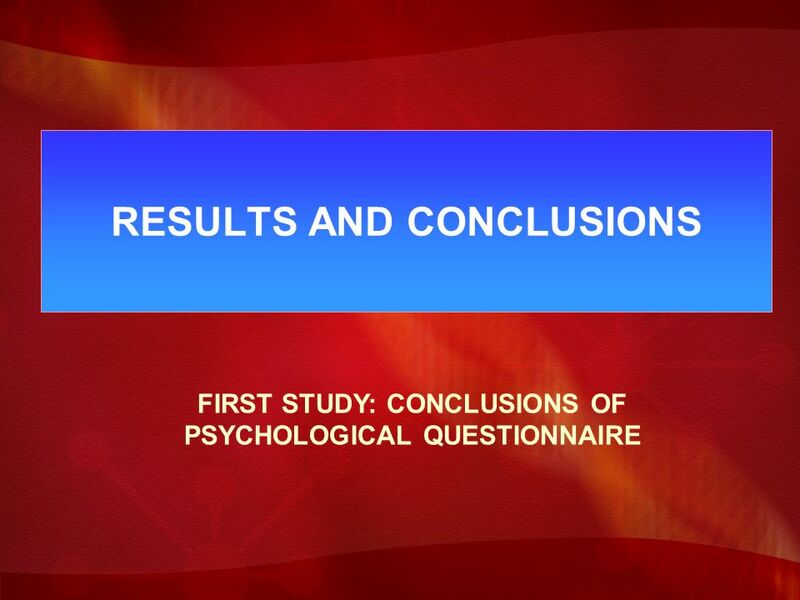 This Questionnaire assesses the following areas: Oral Expression, Writing, Reading, Mathematical Problems, Calculation, Artistic Expression, Daily Life, Social Relations, Attention, Memory and Global Assessment. 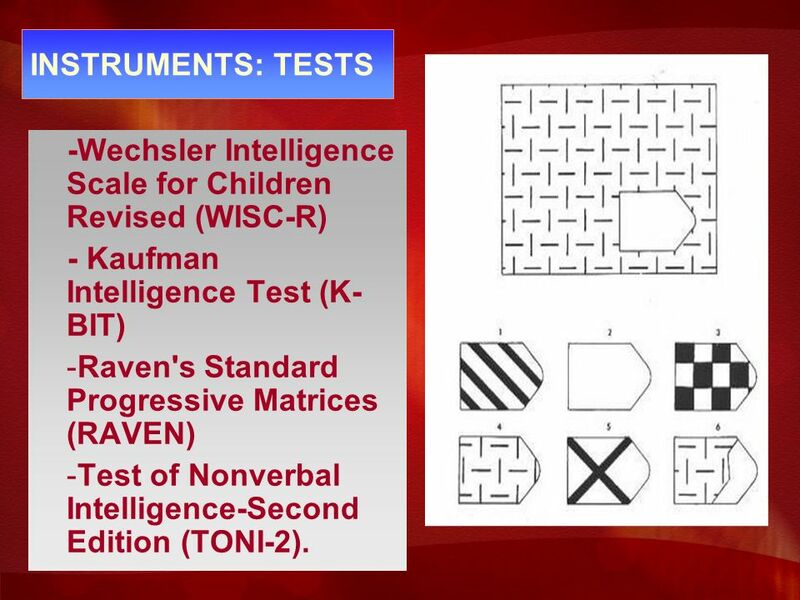 10 INSTRUMENTS: TESTS -Wechsler Intelligence Scale for Children Revised (WISC-R) - Kaufman Intelligence Test (K- BIT) -Raven's Standard Progressive Matrices (RAVEN) -Test of Nonverbal Intelligence-Second Edition (TONI-2). 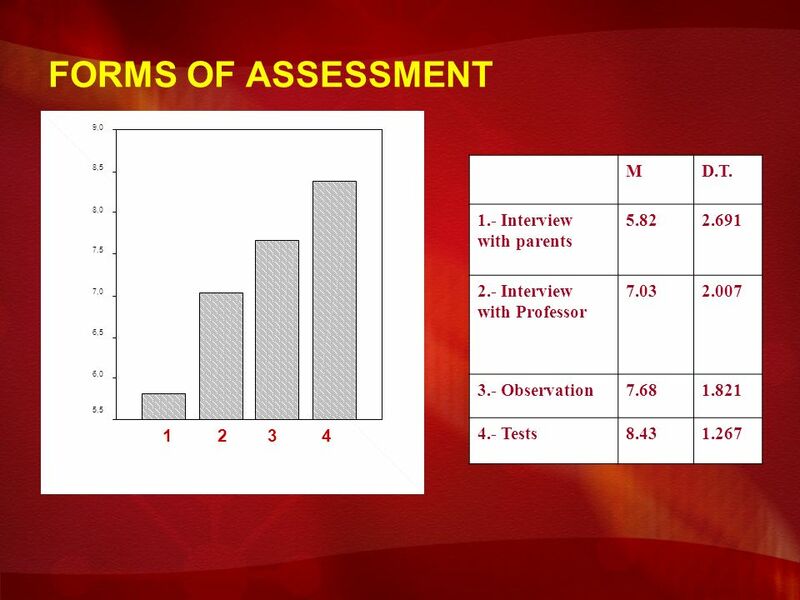 11 PROCEDURE In 2002-2003 the first Questionnaire was filled in by psychologists and during the academic years 2002-2003 and 2003-2004, the second Questionnaire was filled in by teachers about their children and we have administered standard intelligence tests to the same students. Discapacidad intelectual y necesidades educativas especiales asociadas: retraso mental ligero frente a retraso límite. Tesis Doctoral. (CD-ROM). Ed. 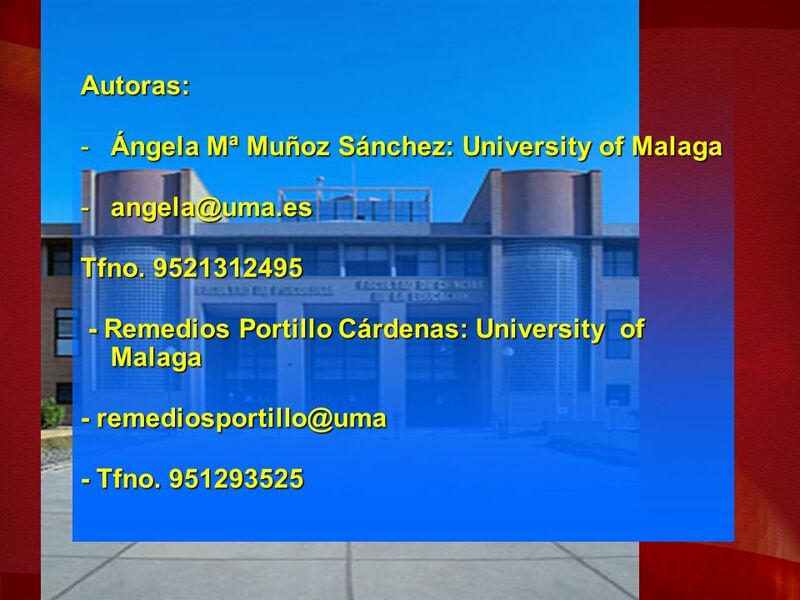 Servicio de Publicaciones Universidad de Málaga. 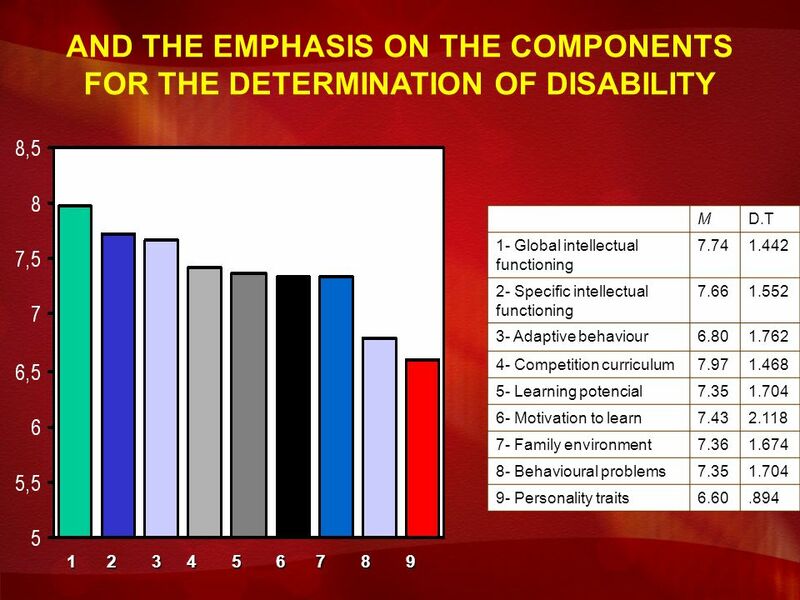 23 4º - B) Differences in factors of Criteria 4º - B) Differences in factors of QUESTIONNAIRE Criteria (1 = Attention-memory, 2 = Reading Scripture 3 = Artistic Expression, 4 = Speaking, 5 = Adaptive Behaviour, 6 = Mathematical Logic ) Estimated marginal averages Assignation to group without disability with disability F (5.119) =4.29; p<.001], which show that the scores on the questionnaire Criteria vary with the assignment or not disability. 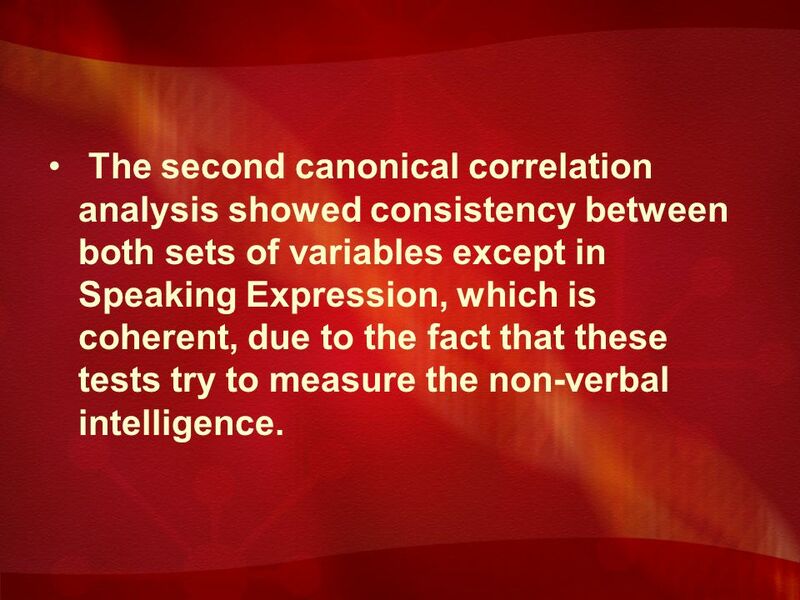 26 The second canonical correlation analysis showed consistency between both sets of variables except in Speaking Expression, which is coherent, due to the fact that these tests try to measure the non-verbal intelligence. 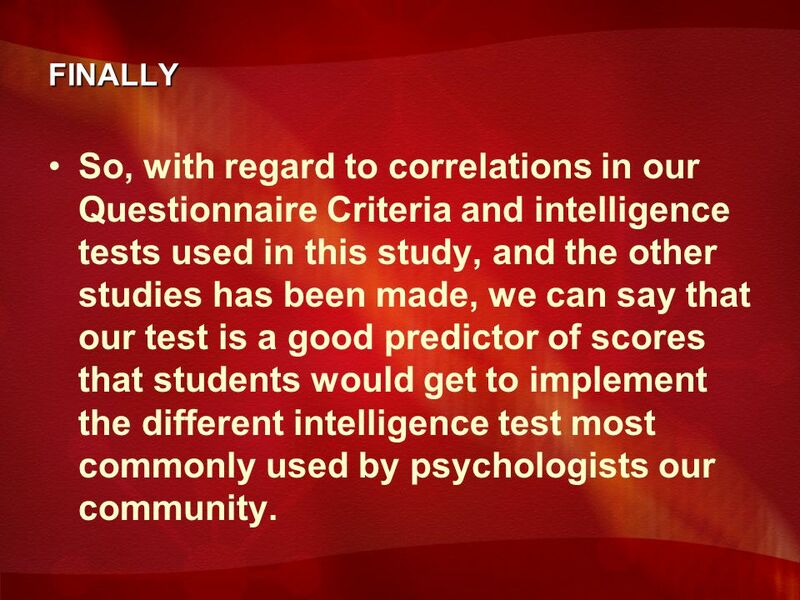 28 FINALLY So, with regard to correlations in our Questionnaire Criteria and intelligence tests used in this study, and the other studies has been made, we can say that our test is a good predictor of scores that students would get to implement the different intelligence test most commonly used by psychologists our community. 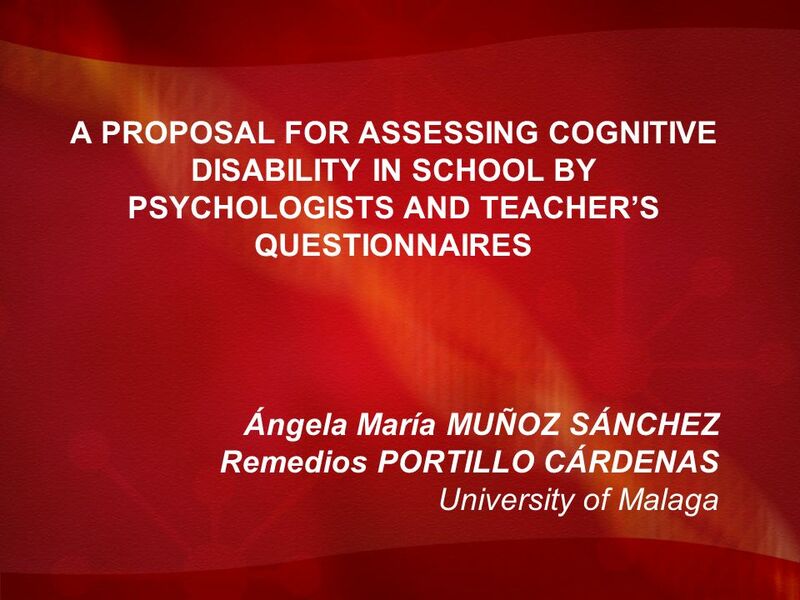 Download ppt "A PROPOSAL FOR ASSESSING COGNITIVE DISABILITY IN SCHOOL BY PSYCHOLOGISTS AND TEACHERS QUESTIONNAIRES Ángela María MUÑOZ SÁNCHEZ Remedios PORTILLO CÁRDENAS." 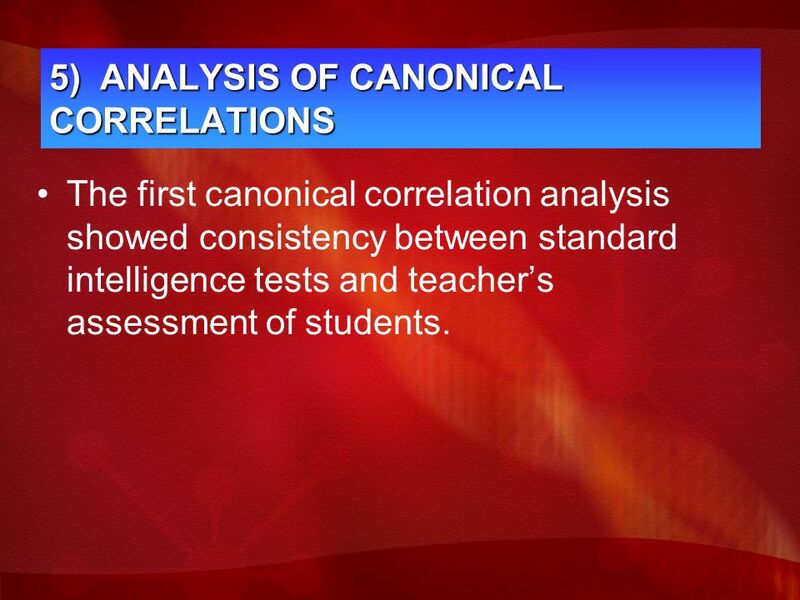 1 Testing Standards Reliability –The degree to which a procedure or test will yield the same results under the same conditions 1.Test-retest reliability. 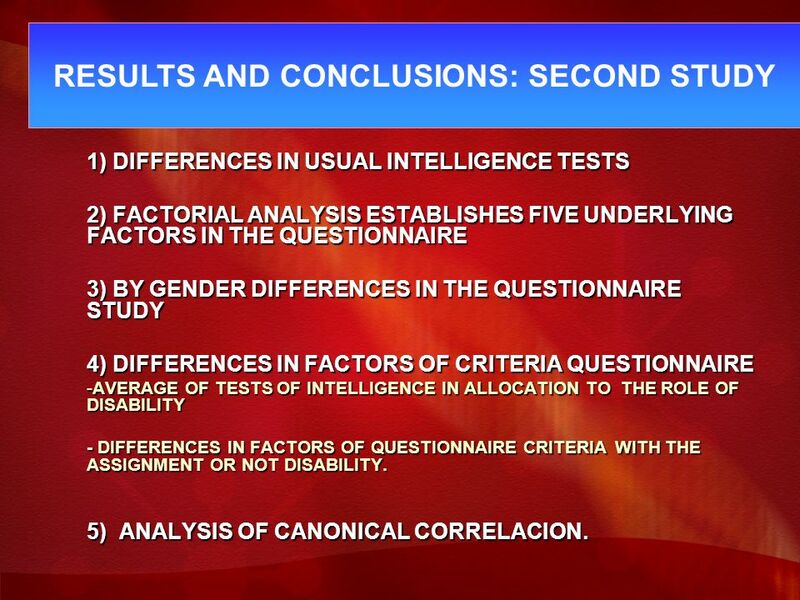 Intelligence Carolyn R. Fallahi, Ph. D. 1. 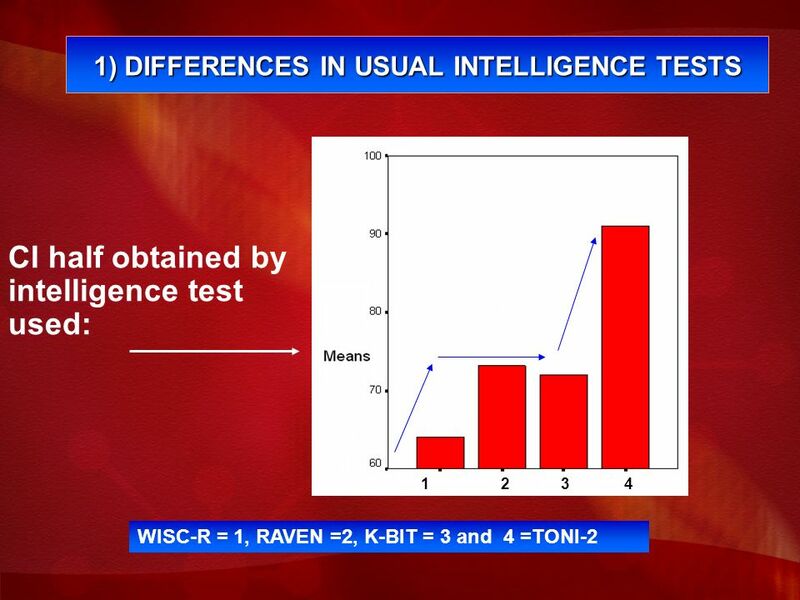 Intelligence Why do we want to measure intelligence? 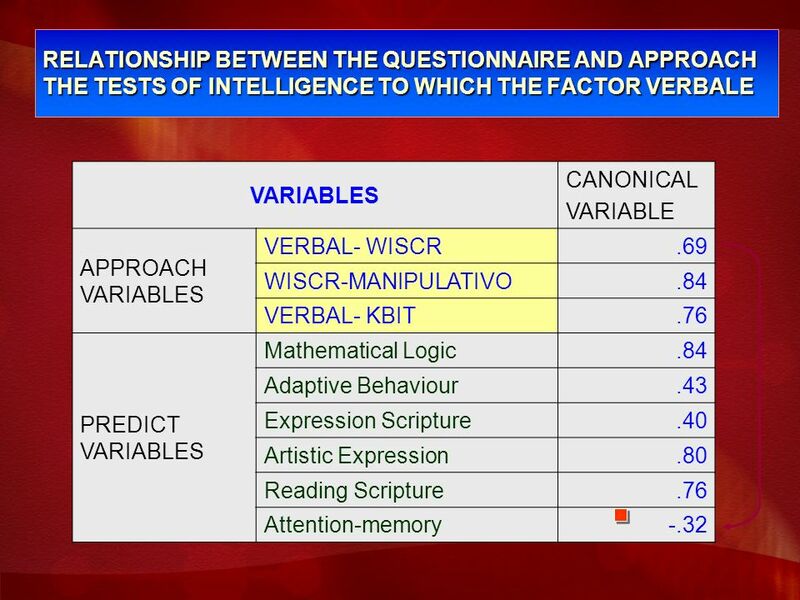 What are some of the reasons we measure intelligence? E. Marchena Consejero 1, 2, A.M. Araujo Hoyos 1, 2, C. Romero Lopez Alberca 1, 2, I. Menacho Jimenez 1, M.M. López Sinoga 2, M. Aguilar Villagrán 1, J.I. Third Grade AIG Nomination and Identification 101 OR: Everything you Wanted to Know about how Students are Identified but were Afraid to Ask. 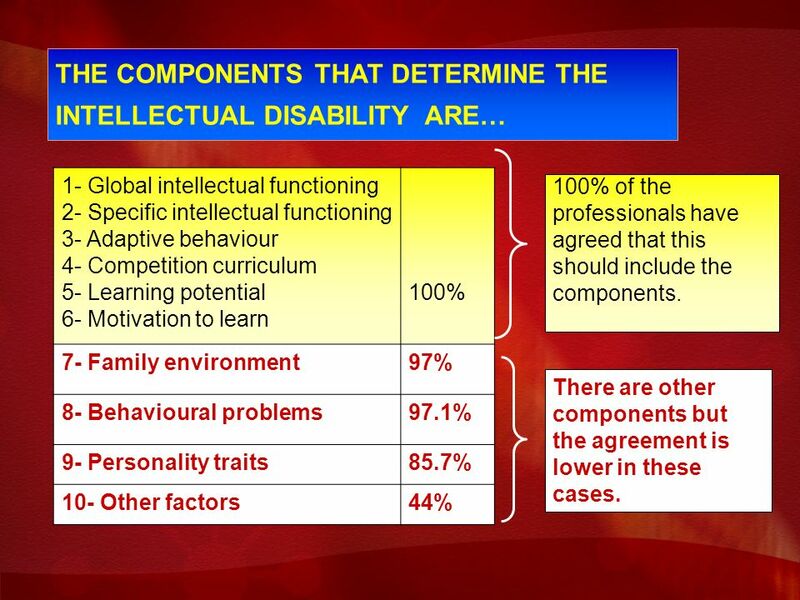 COGNITIVE DISABILITIES Definition and Eligibility Criteria August 2010. 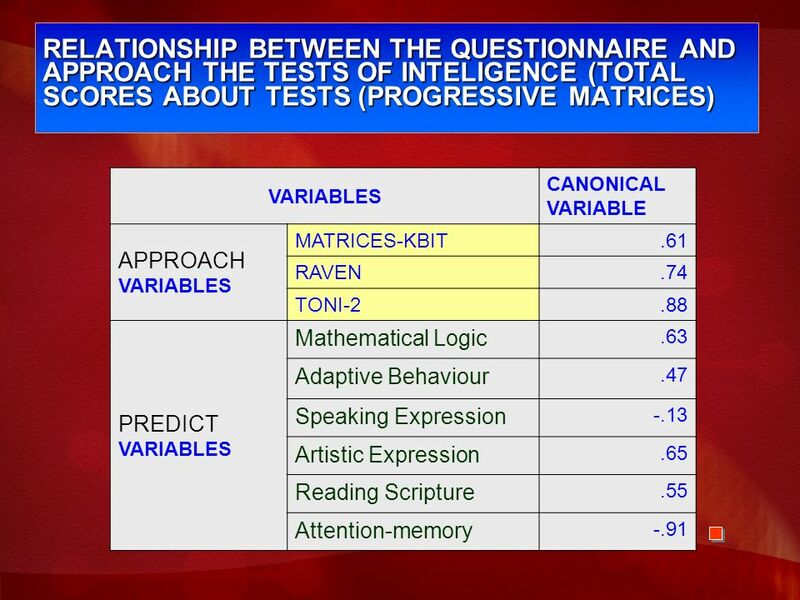 INTRODUCTIONRESULTS PURPOSE METHODS CONCLUSION The Correlation between Parental Perception of Movement Difficulties and Scoring on a Motor Proficiency. 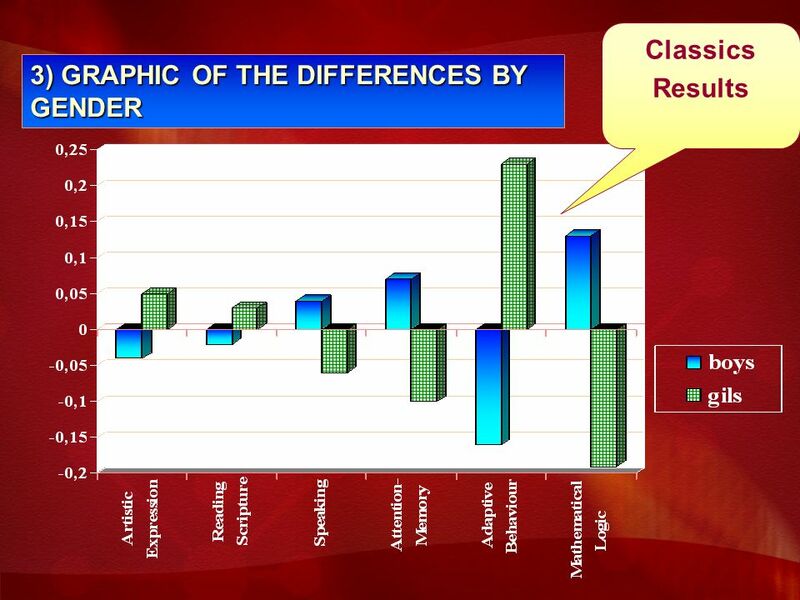 THE ASSESSMENT OF MENTAL RETARDATION IN CAPITAL CASES Jeffrey C. Holden, Ph.D. Chief of Transition Services Murdoch Center. Chapter 3 Assessment for Identification © Taylor & Francis 2015. 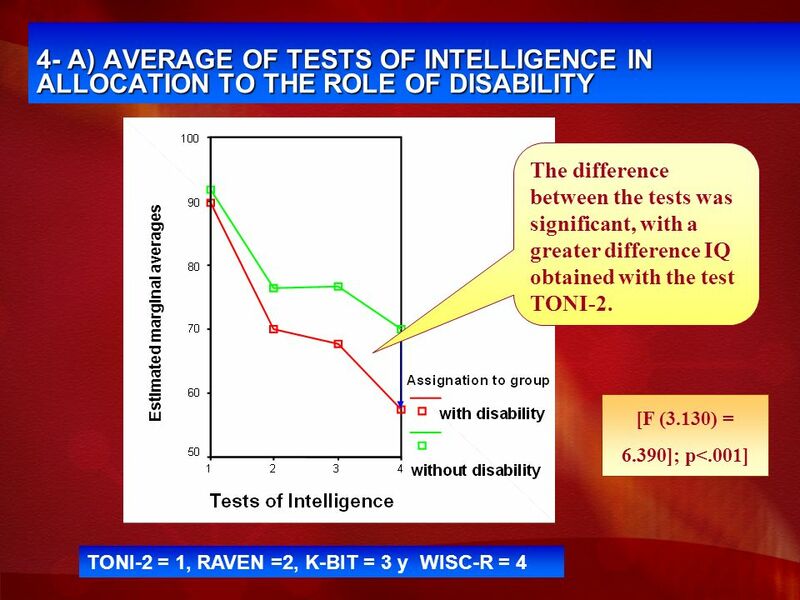 ASSESSMENT OF INTELLIGENCE Chapter Nine. 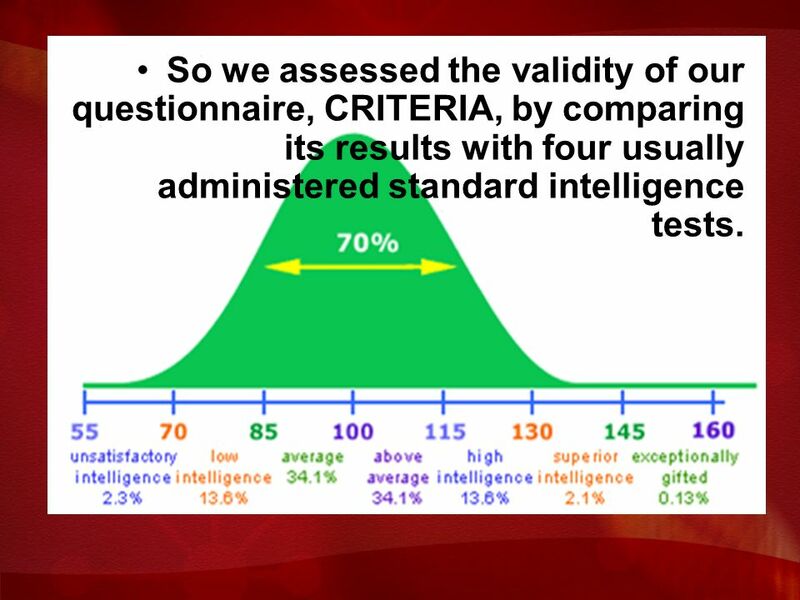 CHAPTER OBJECTIVES The complexity of intelligence The purpose of intelligence testing What IQ score represent. Author: Sabrina Hinton. Year and Publisher: American Guidance Service. Assessment: Understanding the Psycho-Educational Evaluation Elizabeth A. Rizzi, MA NYS Certified School Psychologist John Jay High School. Five Areas of Giftedness In-Service Training. 704 KAR 3:285. 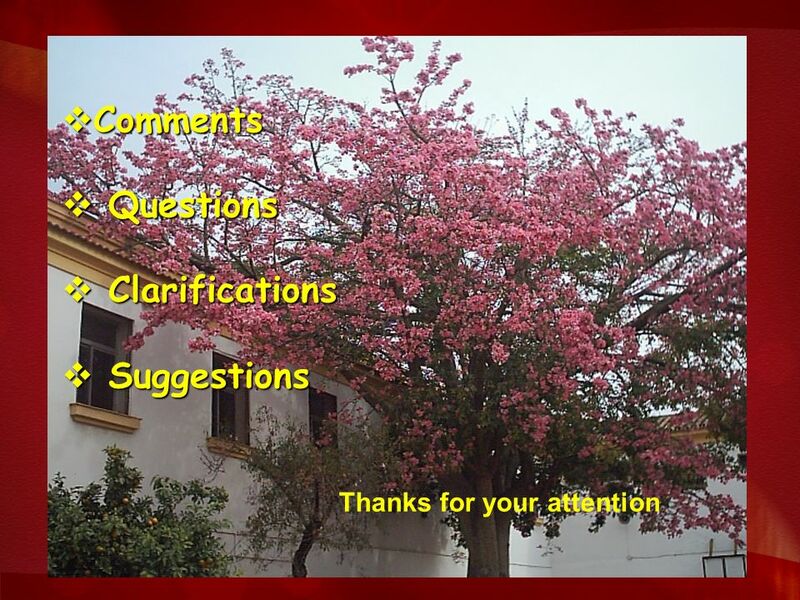 A large part of the law is devoted to describing instructional strategies for educators to.